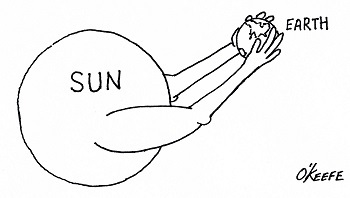 We left off with Edmund Halley’s proposed method to solve the riddle of Earth’s distance to the sun. Halley posited that when Venus’ orbit brought it directly between the Earth and sun, then principles of astronomy, trigonometry, and geometry could be combined to calculate that distance. Instrumental to Halley’s theory were a number of elements discussed previously in this blog series, including the work of Johannes Kepler. We’ll mesh those elements today and chart the course for future discoveries. which meant that if the distance from Earth to Venus, rVenus, could be calculated, then the distance from Earth to the sun was easily deduced, a matter of simple division. Crucial to the calculation of rVenus is to find the value for the angle α which forms between observers’ lines of sight while charting Venus’ travel across the face of the sun, something which only happens during a rare astronomical event known as the Transit of Venus. See Figure 1. Figure 1 shows two observers positioned on opposite sides of the Earth, busily surveying Venus’ movement across the sun’s face. Their lines of sight converge at a vertex point, or point of intersection, on Venus, then move beyond it to the sun. Due to the principle of vertical angles, which stipulates that angles which share the same vertex point also share the same angle measurement, we know that the angle α that’s formed between Observer A and B‘s lines of sight is of the same value between Earth and Venus as it is between Venus and the sun. Follow this link to Optically Measuring Cosmic Distances for a review. As for the variable d, the distance between the two observers, we’ve worked with that before, too. Follow this link to Determining Chord Length on Circle Earth for a refresher. Next time we’ll see how Venus’ travel path is key to determining the angle α, shown in green on the illustration, and how this angle is crucial to our discovery of the distance between Earth and the sun. We’ve been working on calculating Earth’s distance to the sun and discussing how past scientists, including Johannes Kepler and Edmund Halley, contributed to the discussion. 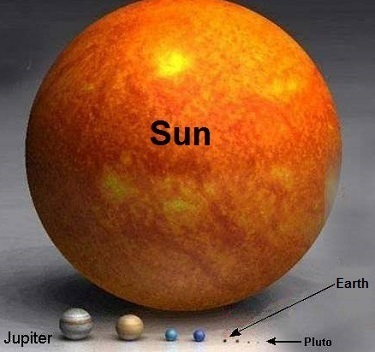 Today we’ll see how Halley used his theory on the transit of Venus together with Kepler’s Third Law of Planetary Motion and combined them with known mathematical principles to solve the riddle of this enormous distance, known as one astronomical unit, or AU. Halley’s solution began with stationing two observers with telescopes aimed at Venus on opposite sides of the Earth. Their different lines of sight would cause the principle of parallax to come into play, resulting in them seeing Venus from different perspectives. Their sight would converge at Venus’ center and an angle, α, would form between them. Halley posited that if this angle could be measured, it would be an important first step in calculating the distance between Earth and the sun. See Figure 1. 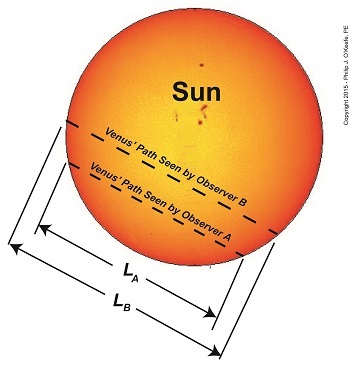 Due to their differing perspectives, Observer A would see Venus traveling a path lower on the sun’s face, while Observer B would see it following a path higher up. See Figure 2. The net result was that the length, LA, of Venus’ path as seen by Observer A was significantly shorter than length, LB, of Venus’ path as seen by Observer B. Because of this, Observer B would have seen Venus pass in front of the sun before Observer A. These differing observations meant that even if both observers were to set their telescopic crosshairs on Venus at the exact same moment it became visible to each of them, it would serve no purpose, because they lacked a common point of reference at which to aim in order to take measurements. This fact made measuring the angle α with a physical device such as a protractor impossible. So Halley gave up on the idea of physically measuring α. Instead, he proposed calculating it based on the time it took for Observers A and B to watch Venus traverse the sun’s face from one side to the other along each of their observational paths. Next time we’ll see how Halley put his idea to work to calculate α and used it in conjunction with Kepler’s Third Law to calculate the AU.